Mesa Verde National Park is a U.S. National Park and UNESCO World Heritage Site located in Montezuma County, Colorado, United States. The park occupies 81.4 square miles (211 km) (211 square kilometers) near the Four Corners and features numerous ruins of homes and villages built by the Ancestral Puebloan people, sometimes called the Anasazi. Rocky Mountain National Park is a national park located in the north-central region of the U.S. state of Colorado. It features majestic mountain views, a variety of wildlife, varied climates and environments—from wooded forests to mountain tundra—and easy access to back-country trails and campsites. The park is located northwest of Boulder, Colorado, in the Rockies, and includes the Continental Divide and the headwaters of the Colorado River. The park has five visitor centers. Colorado Springs is a Home Rule Municipality that is the county seat and most populous city of El Paso County, Colorado, United States. It is situated on Fountain Creek and is located just east of the geographic center of the state and 61 miles (98 km) south of the Colorado State Capitol in Denver. At 6,035 feet the city sits over one mile above sea level, though some areas of the city are significantly higher. Aspen Mountain is a mountain in the Rocky Mountains of Colorado in the United States. 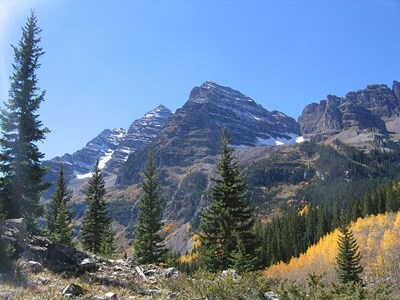 One of the foothills of the Elk Mountains, it is located just south of the town of Aspen, which is situated at the foot of the mountain at the southeast end of the valley of the Roaring Fork River in Pitkin County. The mountain is noted as the location of the Aspen Mountain ski area, one of four adjacent ski areas operated collectively as Aspen/Snowmass. The Mollie Kathleen Gold Mine is a historic vertical shaft mine near Cripple Creek, Colorado. The mine shaft descends 1000 feet into the mountain, a depth roughly equal to the height of the Empire State Building in New York. The mine currently gives tours, and is visited by around 40,000 people annually. The addition of the mines and subsequent tours of this mine and others in the area had considerable effect on the economies of both Victor, Colorado and Cripple Creek. The Royal Gorge Bridge is a tourist attraction near Cañon City, Colorado, within a 360-acre (150 ha) theme park. The bridge deck hangs 955 feet (291 m) above the Arkansas River, and held the record of highest bridge in the world from 1929 until 2003, when it was surpassed by a bridge in China. It is a suspension bridge with a main span of 938 feet (286 m). The bridge is 1,260 feet (384 m) long and 18 feet (5.5 m) wide, with a wooden walkway with 1292 planks.